I was at the opening of a new swatch store lately, and thats why this funny watch came with me. I had a discussion about all the cities and cantons in switzerland with some friends. The watch shows them all, so there is no chance to forget any of them. The little Bag is from Maison Mollerus. I really love the stuff they create.Very classy but trendy. 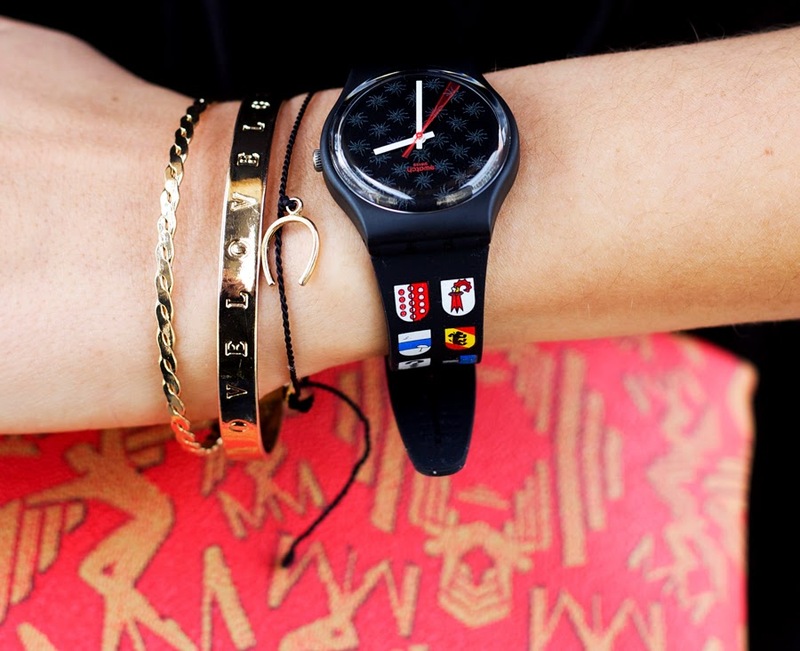 Both, Swatch and Maison Mollerus are Swiss Labels, and because of that, I'm a bit proud to be swiss right now. And it seems, I just started to like orange - maybe because of my jacket I wore a lot lately. The overall on the pictures is from YAS, I strolled across this label, and I tell you, you cannot image something more comfortable than this overall. And I really like the look a lot as well. I can wear it on daytime with a sweater on top, or for clubbing, just with a leatherjacket. It's the perfect all rounder.